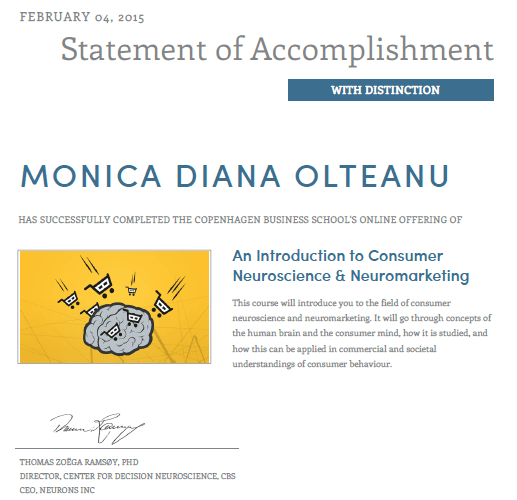 On the 10th of November 2014, I enthusiastically enrolled to the first online neuromarketing course on Coursera.org: An Introduction to Consumer Neuroscience & Neuromarketing (just like the book: Introduction to Neuromarketing & Consumer Neuroscience), having Prof. Thomas Zoëga Ramsøy (PhD & Certified Neuropsychologist, Assistant Professor in Marketing & Neuroscience) as instructor. Neuroethics and consumer aberrations; Interview with Jan Trzaskowksi; Interview with Carl Marci. Each week everyone enrolled had to take a short test and prove the knowledge gained from the video lectures, interviews with top professionals and bibliography (Introduction to Neuromarketing & Consumer Neuroscience, Neuromarketing for Dummies and the freely available Selected Readings in Consumer Neuroscience & Neuromarketing). This introductory course draws on fields like biology, psychology and marketing, examining the basic concepts of the human brain, the elements of the consumer mind and how its insights can be applied in commercial and societal understandings of consumer behaviour. After completing the course, participants can understand what drives decisions – and the role played by emotions, memory and learning. 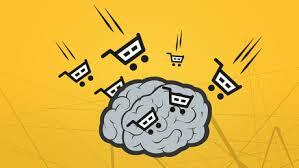 The first session ended and over 48.000 people followed it, but if you are not among them you should check for future sessions (of this course and also advanced courses that are being prepared by Prof. Ramsøy), as this is a very interesting course that provides the necessary information in order to make you understand the basics in consumer neuroscience. Were you also enrolled to this course? If yes, please share below your experience and your thoughts on the course content. Hi! Congrats! I was wondering whether you still have the “Selected Readings in Consumer Neuroscience & Neuromarketing” file. Would be great to have it. Thanks!